At first this seemed like a really dumb story wrapped in wonderful silky language. A married American couple and their good friend travel around North Africa in the post-WWII days. They have no comprehension of local language, customs, geography. They are unaware of how dangerous what they are doing is what with unscrupulous natives, disease and animals. 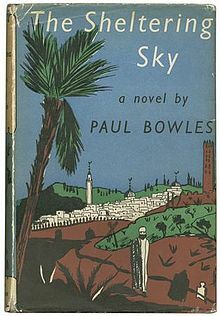 It might take place in the Sahara but we don’t really learn much about that area of the world until later in the novel. It’s unexpectedly different (to the couple), wild and brutal to women. It’s really about rich, selfish, ignorant, self-centered, hypocritical Americans going through some kind of timely existential angst – a dated stereotype at this point (or is it?). Thanks to “long, lush interior monologues,” the story moves very slowly and really only gets off the ground in the last half or two-thirds. I’m just not a fan of that style (unless it’s very well done – see An Unnecessary Woman by Rabih Alameddine. But in the New York Times of the year published, Tennessee Williams thought Bowles “a mature and sophisticated” writer in the vein of Sartre, Camus, Gide. (I’ve enjoyed Camus and Gide.) But where Williams sees the greats, I can see comparing Bowles to Lawrence Durrell and Macomb Lowery – or maybe a combination of Henry James and Somerset Maugham in some way. The protagonist, Kit, is so passive it slows the narrative even more and the narrator, Jennifer Connolly makes it worse- I think she thinks she’s reading a very gentle love story – it’s not. It gets really rough in the second half. For some reason this is called “realism” or “realist,” but I think I don’t want to live that kind of realism and I sure wouldn’t want to read it if I lived it. Why do such beautifully written noels have to be about really horrendous things? One thing – when I finally got to the end I didn’t really know what was happening and had to go back and reread. Maybe I should do that with the whole thing. ?? Maybe I just wasn’t attending. I read this a long time ago, but I barely remember it. I’d like to read it again. Thanks for the post! I finished reading and writing late last night and this morning had to change a bunch -(lol). I likely should reread it, too, as when it ended I wasn’t too sure about the whys – why did Kit run? I didn’t really understand. Needs a reread.